Discussion in '"Boat Anchor" & Classic Equipment' started by WA2FXM, Sep 13, 2018. Working my way through restoring a pretty hacked up Valiant. Underneath the 4 hefty Sangamo output coupling capacitors connected appropriately (almost) to SW6 I find this "sandwich" component with the same connections to SW6. It's labelled Q22.1316 which sounds like an official Johnson part number but I'm not finding that in any parts lists that I have. Is this the original output capacitor stack and the Sangamos were redundant? That is C-42 which is a special capacitor which includes 600 pf, 900 pf, and 1200 pf according to the parts list on Page 35 of the manual. Thanks Glen. I was working off of the Valiant 2 schematic. Looks like I've got a hybrid of Valiant and Valiant 2 parts to work with. Which of the following front panels are on the unit? The top image is the original Johnson Valiant and the lower image is the Johnson Valiant II. Officially, the first version was NOT "Valiant I", just Valiant. However, the "I" was added by many to help keep the versions different in references. Aha. I always thought the gray one was the original Valiant. So, I've never seen a real 2 before. This one is indeed a brown front panel but like I said it's been hacked up a lot. I'm using the Valiant Assembly instructions to verify the wiring but some of the component values are following the Valiant 2 schematic. I'm about 3/4 of the way done with the under chassis. Hoping to be able to put some power to it before the snow starts flying up here in a few months. 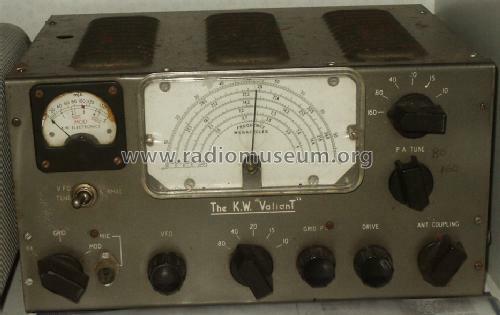 I suspected that you had one of the original Valiant transmitters. There are not all that many of the Valiant II versions around. The Valiant II came out in 1962 and SSB was starting to gain popularity and the sales of AM transmitters was starting to wane. 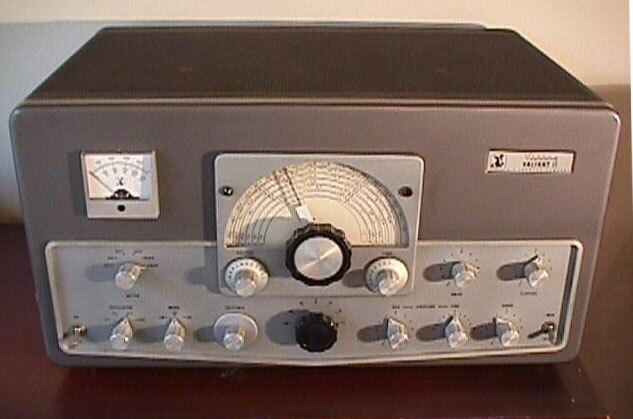 The Heath single band SSB transceivers, HW-12, HW-22, and HW-32, came out in 1963 and that signaled the death knell for AM transmitters. Of course, AM has never died out. But, SSB took over the majority of HF phone operation by the mid to late 1960s. It had a QV06-20 in the PA, modulated by a pair of 6L6s in push-pull. Nearly all the Transmitters from this British company began with V - Vanguard, Victor, Viceroy, Vespa, etc.